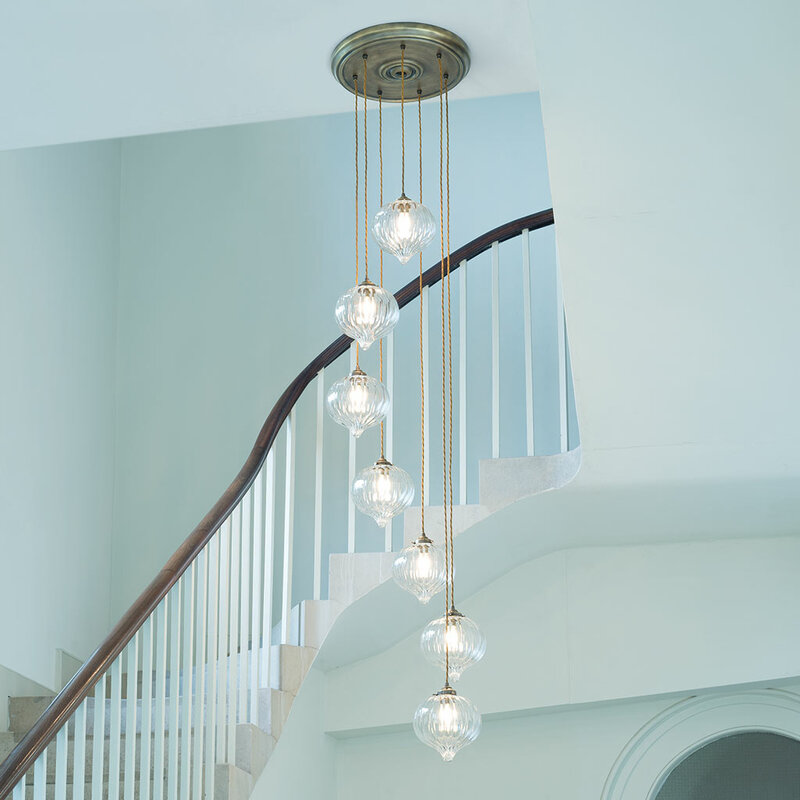 Create a talking point in your home with our spectacular seven pendant, fluted glass Ava Rose that would look magnificent suspended in a stairwell, grand hallway or in any room with a high ceiling. Designed to be showstopper, we at Jim Lawrence have taken our most popular individual pendants and created new and beautiful designs to really show off the quality of the workmanship and the beautiful reflective quality of hand blown glass – and with this cluster pedant light, we think we’ve achieved it. The Seven Pendant Ava features our tear drop shaped Ava pendant shades suspended in a cascade from a large circular rose that has been hand forged from natural brass and lightly antiqued for an aged look. 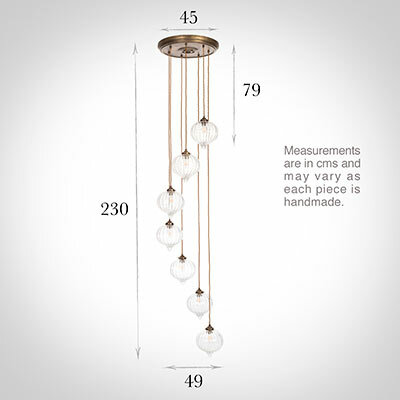 The length of the braided cable is set so the glass shades sit comfortably together in a beautiful configuration, winding clockwise from the shortest to the longest. The overall maximum height is 230cm and the shortest drop is 79cm. 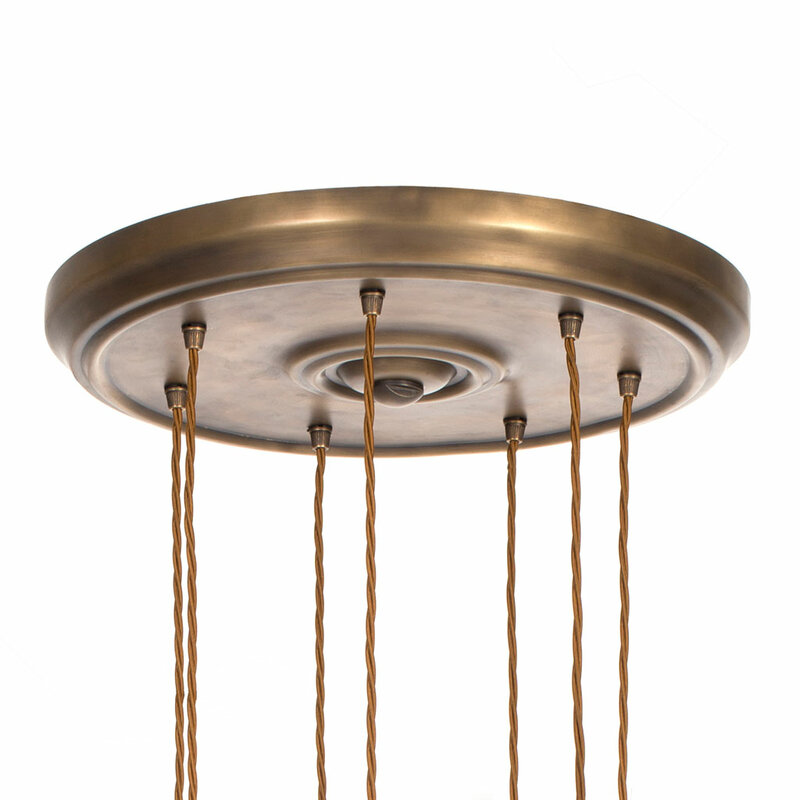 The Antiqued Brass rose is designed to screw into the ceiling and requires just one set of cables for the whole light, while the braided cable for the pendants can be shortened to length if required. Fitting Option: can be supplied with an E14 (Small Edison Screw) bulb holder for Europe on request. 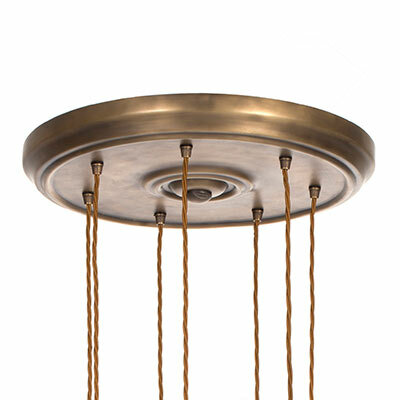 Weight: This is a large light weighing in at 12.5kg. Additional Information: we have worked out the perfect configuration, however if you require different cable lengths, please call our helpful sales team to discuss. Banbury ceiling rose diameter 45cm. 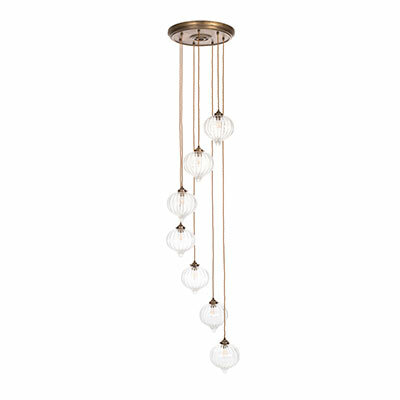 As a statement piece to add ambient lighting in any room a vaulted or high ceiling. Suspending in a large stairwell, second story landing, grand hallway or mezzanine. As a piece of lighting artwork in a corner of an open plan space. 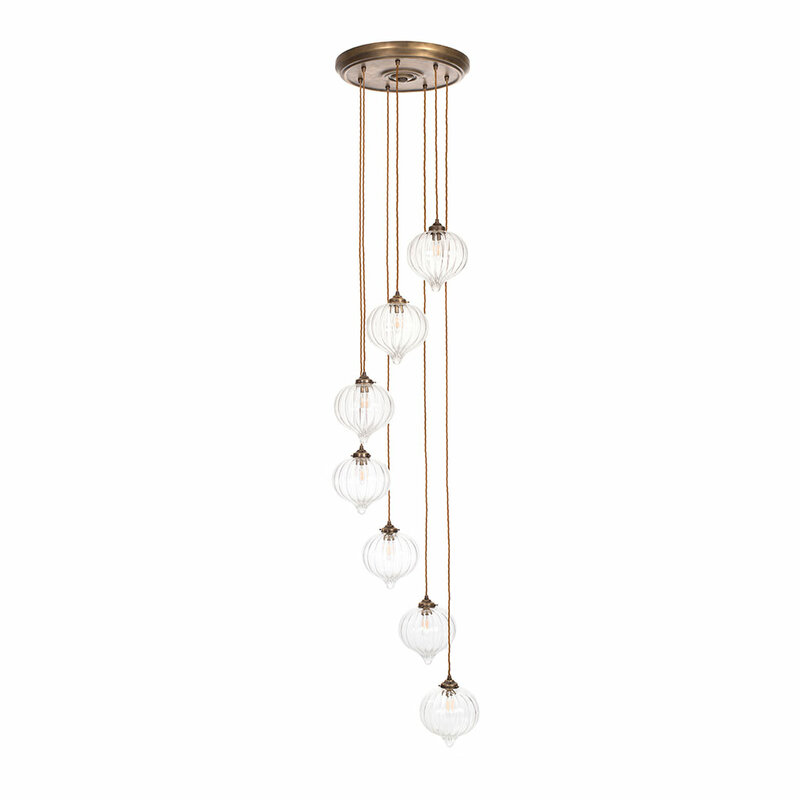 Our range of Ava pendants and flush fitting ceiling lights for a similar look elsewhere in your home including bathrooms and outdoors. 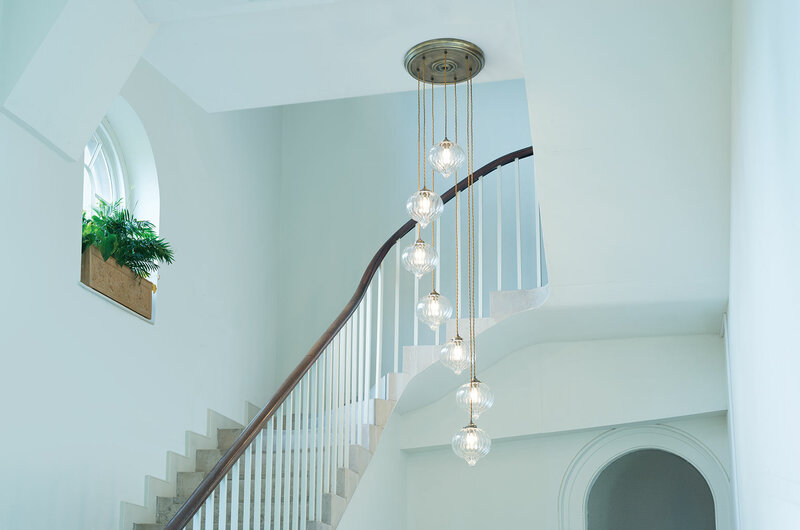 We recommend our Clear Candle LED bulb as the perfect accompaniment to your pendant light.